The ruffed grouse (Bonasa umbellus) is a medium-sized grouse occurring in forests from the Appalachian Mountains across Canada to Alaska. It is non-migratory. It is the only species in the genus Bonasa. The ruffed grouse is the state bird of Pennsylvania, United States. These chunky, medium-sized birds weigh from 450–750 g (0.99–1.65 lb), measure from 40 to 50 cm (16 to 20 in) in length and span 50–64 cm (20–25 in) across their short, strong wings. Ruffed grouse have two distinct morphs: grey and brown. In the grey morph, the head, neck and back are grey-brown; the breast is light with barring. There is much white on the underside and flanks, and overall the birds have a variegated appearance; the throat is often distinctly lighter. The tail is essentially the same brownish grey, with regular barring and a broad black band near the end ("subterminal"). Brown-morph birds have tails of the same color and pattern, but the rest of the plumage is much more brown, giving the appearance of a more uniform bird with less light plumage below and a conspicuously grey tail. There are all sorts of intergrades between the most typical morphs; warmer and more humid conditions favor browner birds in general. The ruffs are on the sides of the neck in both sexes. They also have a crest on top of their head, which sometimes lies flat. Both genders are similarly marked and sized, making them difficult to tell apart, even in hand. The female often has a broken subterminal tail band, while males tend to have unbroken tail bands, though the opposite of either can occur. Females may also do a display similar to the male. Another fairly accurate sign is that rump feathers with a single white dot indicate a female; rump feathers with more than one white dot indicate a male. The ruffed grouse differs from other grouse species in its courtship display. Unlike other grouse species, the ruffed grouse relies entirely on a non-vocal acoustic display, known as drumming. The drumming itself is a rapid, wing-beating display that creates a low frequency sound, starting slow and speeding up (thump ... thump ... thump..thump-thump-thump-thump). Even in thick woods this can be heard for a .25 miles (0.40 km) or more. The ruffed grouse spends most of its time quietly on the ground, and when surprised, may explode into flight, beating their wings very loudly. In the winter, they will burrow into the snow for warmth, and may suddenly burst out of the snow when approached too closely. ^ BirdLife International (2012). "Bonasa umbellus". IUCN Red List of Threatened Species. Version 2013.2. International Union for Conservation of Nature. Retrieved 26 November 2013. ^ Haupt, J. (2001). "Bonasa umbellus". Animal Diversity Web. Retrieved 10 March 2014. ^ Linnaeus, C. (1766). Systema Naturae. ^ Stephens, J. F. (1819). General Zoology, Vol. XI, Pt. II: Aves. Printed for G. Kearsley. p. 298. ^ Johnson, Chuck; Smith, Jason A. (2009). Wingshooter's Guide to North Dakota: Upland Birds and Waterfowl. Wilderness Adventures Press. p. 31. ISBN 978-1-932098-70-9. ^ Fish, Fur & Feathers: Fish and Wildlife Conservation in Alberta 1905-2005. Fish and Wildlife Historical Society and Federation of Alberta Naturalists. 2005. p. 244. ISBN 978-0-9696134-7-3. ^ Jezioro, Frank. "January and Grouse Hunting Go Together". West Virginia Dept of Commerce. Retrieved 10 March 2014. ^ Gill, F.; Donsker, D., eds. (2015). "IOC World Bird List". worldbirdnames.org. International Ornithologists Union Committee on Nomenclature. doi: 10.14344/IOC.ML.5.3. Retrieved 11 October 2015. ^ "Ruffed Grouse – Life History". Allaboutbirds.org. Cornell Lab of Ornithology. Retrieved 10 March 2013. ^ Johnson, Don L. (1995). Grouse & Woodcock: A Gunner's Guide. Krause Publications. p. 37. ISBN 978-0-87341-346-6. ^ Grouse hunting: Minnesota DNR. Dnr.state.mn.us. Retrieved on 2013-03-10. ^ Furtman, Michael (September–October 2010). "Ups and Downs in the Grouse Woods". Minnesota Conservation Volunteer. Archived from the original on 2013-10-17. Retrieved 9 December 2012. ^ "A Firm Stand for the Quaking Aspen". Vault. Retrieved 2018-06-21. ^ "New Hampshire Ruffed Grouse Assessment 2015" (PDF). ^ "Grouse cycle nearing 10-year peak". PostBulletin.com. Retrieved 2018-06-21. ^ "Ruffed Grouse - Introduction | Birds of North America Online". birdsna.org. Retrieved 2018-06-21. ^ "Ruffed Grouse Facts, Habitat, Diet, Life Cycle, Baby, Pictures". www.animalspot.net. Retrieved 2018-06-21. ^ "RGS History 1960's". www.ruffedgrousesociety.org. Retrieved 2018-06-21. ^ a b "Pennsylvania 2016 Grouse and Woodcock Status Report" (PDF). p. 7. 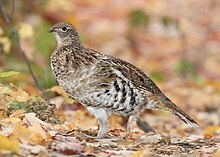 ^ a b "Ruffed Grouse". Wildlife Species. Retrieved 2018-06-21. ^ "Grouse in the Balance" (PDF). ^ a b "PA Game Commission giving special management attention to ruffed grouse". centredaily. Retrieved 2018-06-21. ^ "Grouse research leaves unanswered questions about Pennsylvania's state bird | Penn State University". Retrieved 2018-06-21. ^ Stauffer, Glenn E.; Miller, David A.W. ; Williams, Lisa M.; Brown, Justin (2017-09-20). "Ruffed grouse population declines after introduction of West Nile virus". The Journal of Wildlife Management. 82 (1): 165–172. doi: 10.1002/jwmg.21347. ISSN 0022-541X. ^ "West Nile Virus PA Game Commission Research Summary" (PDF). ^ "Susceptibility of Ruffed Grouse (Bonasa Umbellus) to West Nile Virus" (PDF). Henninger, W.F. (1906). "A preliminary list of the birds of Seneca County, Ohio" (PDF). Wilson Bulletin. 18 (2): 47–60. Ohio Ornithological Society (2004): Annotated Ohio state checklist. Wikimedia Commons has media related to Ruffed Grouse. "Ruffed Grouse media". Internet Bird Collection.